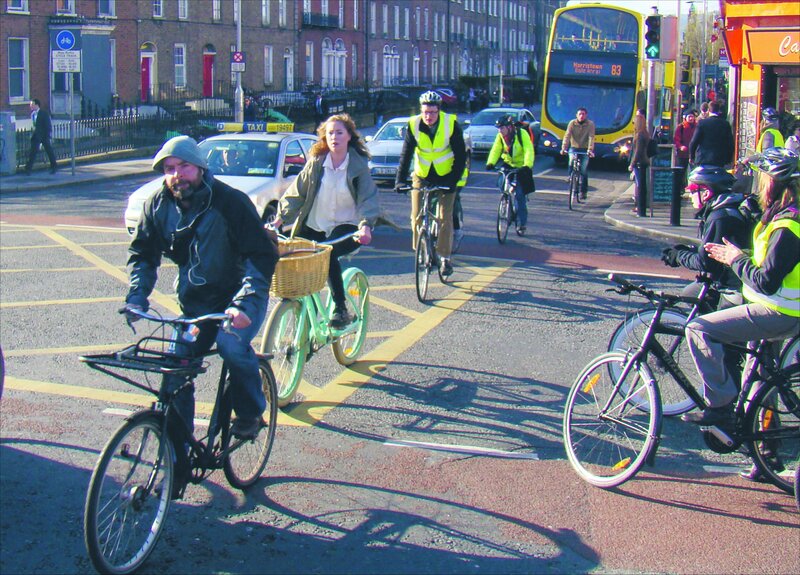 Cycling to work or school is a great way of building activity into your daily life, writes Caroline Peppard, a senior health promotion officer with the HSE. Health and wellbeing are two of the most important resources for a happy and fulfilled life. Choosing an active lifestyle is one of the most important things we can do for our health. For most people the easiest and most acceptable way to do this is by choosing activities that can be easily incorporated into everyday life for example, cycling to work or school instead of driving or using the bike for short journeys. At first this might seem like a daunting task but when you do it once or twice it’s surprising how easy and pleasant it can be. You can now purchase a bike on the bike to work scheme and start by cycling to work on one day per week, for example. As well as saving you money on car fuel and reducing harmful greenhouse gas emissions associated with car usage, there are many health benefits to be had from regular cycling. Your risk of developing chronic disease such as heart disease and some cancers is greatly reduced and regular physical activity has been proven to promote positive mental health. Recent research also shows that doing regular physical activity improves cognitive function and achievement in children. The good news is that many of these benefits are immediate and you continue to benefit even after you have stopped cycling. How much physical activity is recommended for health benefits? For good health the minimum level of physical activity recommended for our children is 60 minutes per day everyday and 30 minutes per day on five days per week for adults. The activity needs to be of moderate intensity. This means that you need to be breathing a little bit heavier than normal, feeling warmer and feeling your heart beat a little bit faster. The easiest way to meet these recommendations is by building activity into daily life, such as by switching from the car to cycling. Leisure cycling or cycling to work is a good form of moderate physical activity and research has shown that switching from a car to a bike for a distance of 7.5kms would enable a person to meet the recommendations. So, how active are we as a nation? We know that currently in Ireland 3 out of 4 adults and 4 out of 5 children are not active enough for good health. This causes concern for the future health of our nation in particular for our children. Low levels of physical activity can lead to overweight and obesity which, as well as being a problem in itself can lead to other related chronic health problems. It is estimated that as a population our obesity levels have doubled over the past 30 years. Because of the many health benefits of cycling and the associated cost savings to health services, international researchers in the area of health economics have developed a system to quantify the economic benefits. The health economic assessment tool (HEAT) for cycling has been used in several countries and it suggests that considerable savings can be made by increasing population levels of cycling. For example in Austria, cycling represents about 5% of travel with an average trip length of 2kms. Applying the model shows that the current level of cycling saves 412 lives per year in terms of reduced mortality from being regularly physically active. This reduced mortality translates to annual savings of €405 million. A frequently cited reason for not cycling is safety. However research from the Netherlands shows that the health benefits from cycling are substantially larger than the risks relative to car driving and increased air pollution associated with traffic. People who switch from car usage to bike usage can expect a nine times increase in life years compared to losses in life years due to increased air pollution or traffic accidents. Because cyclists can more easily choose a low traffic route this also reduces their risk of traffic accidents. For information on how you can meet the recommendations on keeping active see www.getirelandactive.ie. Apart from the most important heart functions (heart rate and stroke volume), blood circulation and the heart muscles are also positively changed during cycling, writes Caroline Peppard. Blood pressure is lowered and this is a major benefit since it reduces the risk of stroke and heart attack. Numerous studies have also shown the beneficial effects on blood cholesterol. A recent large heart health study in Copenhagen proved that cycling had a strong health protective function. In this study measurements such as blood pressure, cholesterol and body mass index were assessed before and after a cycle to work intervention. Even after other lifestyle factors were taken into consideration those who did not cycle to work had a 39% increase in mortality rate compared to those who did. Rising rates of overweight and obesity in Ireland are a major public health concern and can lead to the development of life threatening chronic diseases. In Ireland currently 60% of our female population and 70% of males are overweight or obese which is an increase of 8% or 9% over the past 40 years. Cycling contributes to weight reduction by burning energy. A person can expect burn between 600 and 800 calories per hour cycling depending on fitness levels and the amount of effort. During cycling, almost 70% of the body weight is borne by the saddle and this makes it especially suited for people who are overweight or obese. It increases physical fitness and also stimulates fat metabolism which is so important in weight management. Because it is non weight bearing there is much reduced strain on joints and muscles. For example, during jogging 2 to 3 times the body weight is borne by the hip joint, which would represent a massive overload for an overweight person. Cycling has been proven to have a significant relaxing effect, due to its uniform, cyclic form of movement which results in a harmonious state which leads to a reduction in stress. After cycling for about 30 or 40 minutes “happy” hormones, or endorphins, begin to be released into the bloodstream. These hormones have a profound effect on mood and brain function. This effect continues even after the cycling has stopped. Cycling also actively provides joint protection and reduces the development of arthritis and other joint disorders. Because all the lower body leg muscles are used cycling is a great way to tone and strengthen muscles. The skin also benefits from this activity, due to the increase in blood circulation and the stimulation of metabolic processes which gives the cyclist a “fresh” and “healthy” complexion. Remember to wear sunscreen containing SFP 30 when you are cycling since sunlight and UV rays can come through clouds and reflect off concrete. Cover as much skin as is practical, for example by wearing long sleeves and high neck tops and wear wrap around sunglasses with at least 99% UV protection. Cycling boosts and stimulates the body’s immune system so that it is more resistant to infection and attack by bacteria. These effects continue even after you have finished your cycle.